Feb 10 (AZINS) Jyothika has started shooting for an untitled comedy entertainer, to be directed by S Kalyan. The project will be produced by Suriya's home banner 2D Entertainment and marks his eleventh production. A small pooja for the film was held in Chennai on Sunday morning to kickstart the proceedings. Suriya has just wrapped up the shooting of ace filmmaker Selvaraghavan's NGK and finalized things on Jyothika's next film. Director Kalyan has also written the story, screenplay, and dialogues for the film. 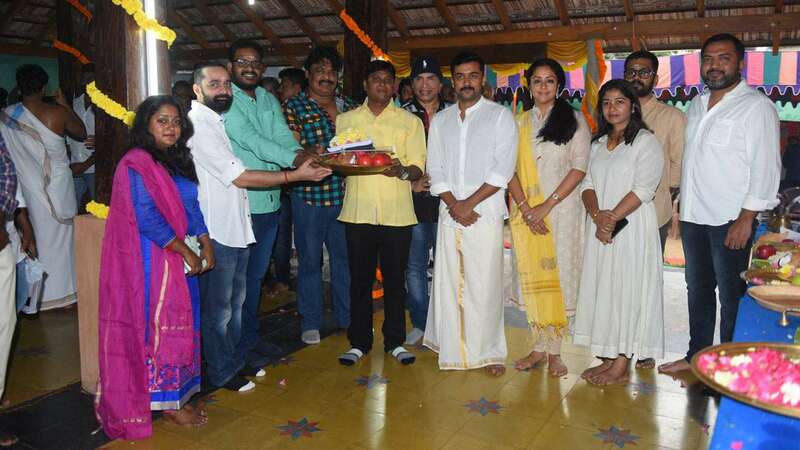 Actress Revathi, Mansoor Ali Khan, and national award-winning director Bramma, who helmed Jyothika's Magalir Mattum, were present for the pooja ceremony. Jyothika was last seen in director Radha Mohan's family drama Kaatrin Mozhi, which was an official remake of Vidya Balan's Tumhari Sulu. The film did decently at the box-office and received a good response from critics as well. This yet-to-be-titled film with Kalyan is said to be another women-centric film from Jyothika, who made her come back through the heroine-led blockbuster 36 Vayadhinile produced by Suriya. Composer Vishal Chandrasekhar of Jil Jung Juk fame has been signed to score the music for the film. The principal shooting for the film is expected to kick off on Monday in Chennai. Meanwhile, Jo has already wrapped up the shooting of another untitled film with debutant director Raj. It is expected to hit the screens sometime in the second quarter of this year.